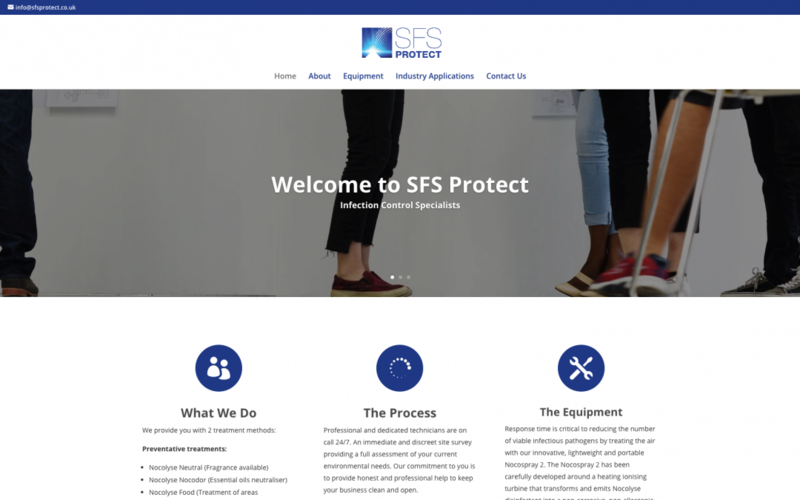 The team here at Gambit Nash are pleased to announce that the SFS Protect Limited website has now gone live. SFS Protect is a Worcester based team of specialists that aim to protect any building, any environment from harmful bacteria and germs. With their caring and discreet services, you can rest assured that any infections are eliminated and controlled without having to close your business. Due to SFS Protect being a new business their was no prior website or branding for us to go off. Our creative design director David spent his time carefully researching and designing the new SFS Protect Logo and website banners. Settling on a blue colour scheme that would help give the user the feeling of being cleaning and healthy. We designed a large array of logos for the client to choose from, eventually deciding on the one that you can see to the to the right of you, or below. Depending on what device you are using. Once this logo was chosen we develop a landscape version to be used within certain parts of the website like the main header. Using the brand images that our Creative Design Director supplied we set to work. The website took just 3-weeks to complete after the customer had submitted their changes and is now live over at https://sfsprotect.co.uk.